Andrew, chairman of the apostolic corps of the kingdom, was born in Capernaum. He was the oldest child in a family of five—himself, his brother Simon, and three sisters. His father, now dead, had been a partner of Zebedee in the fish-drying business at Bethsaida the fishing harbor of Capernaum. When he became an apostle, Andrew was unmarried but made his home with his married brother, Simon Peter. Both were fishermen and partners of James and John the sons of Zebedee. Although Andrew was never an effective preacher, he was an efficient personal worker, being the pioneer missionary of the kingdom in that, as the first chosen apostle, he immediately brought to Jesus his brother, Simon, who subsequently became one of the greatest preachers of the kingdom. 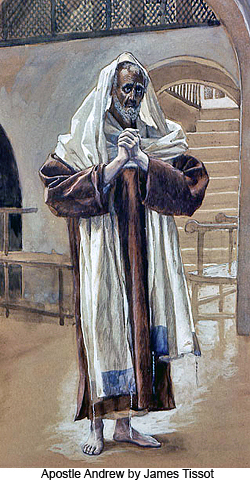 Andrew was the chief supporter of Jesus' policy of utilizing the program of personal work as a means of training the twelve as messengers of the kingdom. Andrew and Peter were very unlike in character and temperament, but it must be recorded everlastingly to their credit that they got along together splendidly. Andrew was never jealous of Peter's oratorical ability. Not often will an older man of Andrew's type be observed exerting such a profound influence over a younger and talented brother. Andrew and Peter never seemed to be in the least jealous of each other's abilities or achievements. Late on the evening of the day of Pentecost, when, largely through the energetic and inspiring preaching of Peter, two thousand souls were added to the kingdom, Andrew said to his brother: "I could not do that, but I am glad I have a brother who could." To which Peter replied: "And but for your bringing me to the Master and by your steadfastness keeping me with him, I should not have been here to do this." Andrew and Peter were the exceptions to the rule, proving that even brothers can live together peaceably and work together effectively. After Pentecost Peter was famous, but it never irritated the older Andrew to spend the rest of his life being introduced as "Simon Peter's brother." Of all the apostles, Andrew was the best judge of men. He knew that trouble was brewing in the heart of Judas Iscariot even when none of the others suspected that anything was wrong with their treasurer; but he told none of them his fears. Andrew's great service to the kingdom was in advising Peter, James, and John concerning the choice of the first missionaries who were sent out to proclaim the gospel, and also in counseling these early leaders about the organization of the administrative affairs of the kingdom. Andrew had a great gift for discovering the hidden resources and latent talents of young people. Very soon after Jesus' ascension on high, Andrew began the writing of a personal record of many of the sayings and doings of his departed Master. After Andrew's death other copies of this private record were made and circulated freely among the early teachers of the Christian church. These informal notes of Andrew's were subsequently edited, amended, altered, and added to until they made up a fairly consecutive narrative of the Master's life on earth. The last of these few altered and amended copies was destroyed by fire at Alexandria about one hundred years after the original was written by the first chosen of the twelve apostles.